Impatiens walleriana (syn. Impatiens sultanii), also known as busy Lizzie (British Isles), balsam, sultana, or simply impatiens, is a species of the genus Impatiens, native to eastern Africa from Kenya to Mozambique. The Latin specific epithet walleriana honours a British missionary, Horace Waller (1833-1896). It is a flowering herbaceous perennial plant growing to 15–60 cm (6–24 in) tall, with broad lanceolate leaves 3–12 cm long and 2–5 cm broad. Leaves are mostly alternate, although they may be opposite near the top of the plant. The changeable, simple leaves are stalked 1.5 to 6 cm long. The leaf blade is ovate to broadly elliptic, sometimes obovate, 2.5 to 13 inches long and 2 to 5.5 inches wide, green and sometimes spotted or pink or reddish on the underside. Leaflets are missing. The hermaphroditic, zygomorphic flowers are profusely borne, 2–5 cm diameter, with five petals and a 1 cm spur. The seedpod explodes when ripe in the same manner as other Impatiens species, an evolutionary adaptation for seed dispersal. The lower sepals are slightly boat-shaped and narrow suddenly in the 2.8 to 4.5 inches long, thread-like curved, but not curved back spur. The stems are semi-succulent, and all parts of the plant (leaves, stems, flowers, roots) are soft and easily damaged. Although perennial in frost-free growing conditions, it is usually treated as a half-hardy annual in temperate regions (though pot-grown plants can be successfully overwintered indoors). It is one of the most popular of all bedding plants for parks and gardens worldwide, typically grown in containers but also in bedding schemes. Propagation is by seed or stem cuttings (which often root readily in water). Super Elfin series is the dominantly available commercial cultivar group. This group of impatiens was bred by Claude Hope in Costa Rica. Mr. Hope developed this species from its native wild form into one of the most popular bedding plants in the world. 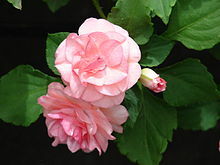 Wikimedia Commons has media related to Impatiens walleriana. ^ "The Plant List: A Working List of All Plant Species". Retrieved 20 January 2014. ^ "RHS Plant Selector - Impatiens Accent series". Retrieved 23 June 2013. ^ "RHS Plant Selector - Impatiens walleriana Super Elfin Series". Retrieved 23 June 2013. ^ "RHS Plant Selector - Impatiens walleriana Tempo Series". Retrieved 23 June 2013. ^ Pink, A. (2004). Gardening for the Million. Project Gutenberg Literary Archive Foundation. ^ "AGM Plants - Ornamental" (PDF). Royal Horticultural Society. July 2017. p. 52. Retrieved 10 March 2018. ^ "RHS Plantfinder - Impatiens 'Divine Violet' (Divine Series)". Retrieved 12 March 2018. ^ "RHS Plantfinder - Impatiens Magnum Wild Salmon (Magnum Series)". Retrieved 12 March 2018. ^ "RHS Plantfinder - Impatiens SunPatiens Compact Blush Pink = Sakimp013 (SunPatiens Series)". Retrieved 12 March 2018. ^ "RHS Plantfinder - Impatiens SunPatiens Compact Electric Orange = 'Sakimp025' (SunPatiens Series)". Retrieved 12 March 2018. ^ "RHS Plantfinder - Impatiens SunPatiens Compact Orange = 'Sakimp011'". Retrieved 7 March 2018. ^ "RHS Plantfinder - Impatiens SunPatiens Spreading Variegated Salmon = 'Sakimp005' (SunPatiens Series)". Retrieved 7 March 2018. ^ "RHS Plantfinder - Impatiens Spreading Variegated White = 'Sakimp018' (SunPatiens Series)". Retrieved 12 March 2018. This page was last edited on 14 April 2019, at 19:04 (UTC).